What I should have also done is have a couple of plates sitting near the ends of the crossmember (where the hole on the top is) then weld a bar down to it. That way when you offer the new floor up, it will but up against those plates and you know its the right height. Don't remove the door steps until the floor is back in! remove the sills and grid down the flange so its just eh door step/rear quarter left, as that gives you another point to clamp up the floor to. Looking forward to seeing the progress to this as i have just purchased a project which needs some welding,brilliant job so far!!! perfect thanks for that Q! just what I wanted to know. I have used "silent coat" which I must admit seems great stuff! sticks like **** on a blanket and has stoped the boot floor from tinging. it now just kinda thuds. I have made a start on the floor..
bracing is complete and I have made a hole....annnnd thats it. in other news though I have taken the rear window out, and to my surprise zero rust!! Edited by Harryrothers93, 23 March 2019 - 06:41 AM. I bet that makes them a lot easier to move around! Good Lord! No wonder a RR weighs the same as an Elephant after a heavy meal. only because I have now ruined the old x member getting the floor out, and patching the heel board has been a nightmare. I will be spending all weekend on the car, today I managed to get most of the prep work ready for the new floor to go in tomorrow. 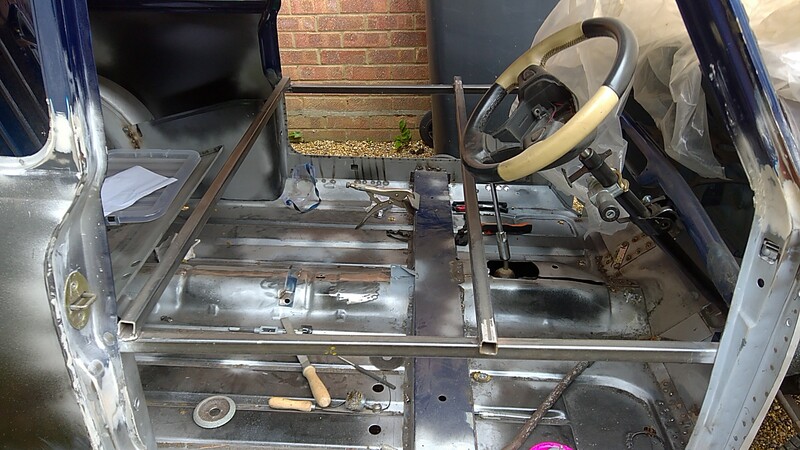 I have seem welded round the left subframe mounting plate but if you look at the right hand side I think its past it and will require some patch work! good news though I have picked up some new shoes for the mini. :) so that being said does anyone have any suggestions on arches for 13x7 wheels? very long day, but... the mother ******* floor is in!